Anopheles cruzi belongs to the subgenus Kertezia, and is found mostly in the southern coasts of Brazil. The mosquitoes inhabits the rain forest canopy, breeding in water collections found in the leaf axils of epiphytic bromeliads. These mosquitoes transmit malaria biting man both indoors and outdoors, especially in the evening althought some female are active throughout the day. 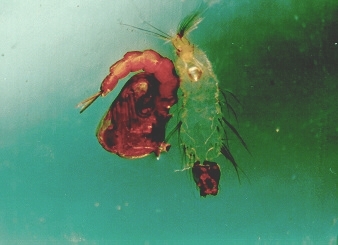 63 kb Larva. Although mosquitoes can be a great nuisance and their bites may cause painful reactions, their chief importance lies in the fact that they are intermediate hosts and vectors of several important parasitic and virus diseases of man and domestic animals. Thus the definitive hosts of species of the protozoan genus Plasmodium, which cause human malaria, are various species of Anopheles. 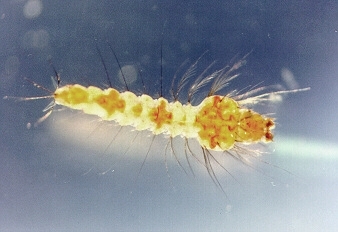 When at rest, and during feeding, the larvae of anophelines float horizontally just beneath the surface film with the palmate hairs and spiracular area in contact with the latter. The pupae are very active, and respire by means of a pair of breathing trumpets communicating with the anterior spiracles. They float at the top of the water with their trumpets attached to the surface film.